ARGUS-IS: Could the Pentagon's 1.8 gigapixel drone camera be used for domestic surveillance? 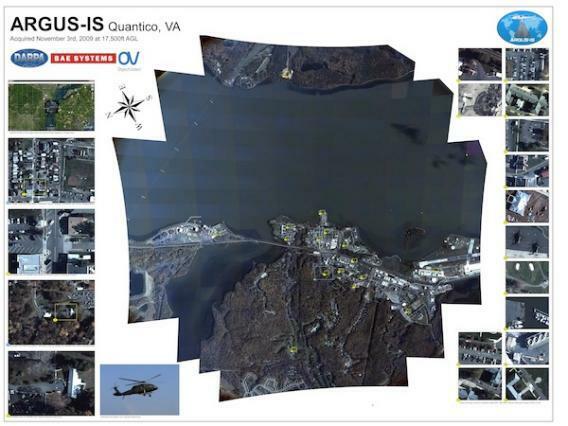 Could the Pentagon’s 1.8 Gigapixel Drone Camera Be Used for Domestic Surveillance? From more than 17,000 feet in the air, it can see an object as small as six inches, tracking people and vehicles across an entire city. But the latest government-funded surveillance technology might be a violation of the Constitution if it is deployed in the United States, according to civil liberties groups. A constant eye in the sky hovering above a city, able to track movements and zoom in on any area in the past or present, could be powerful a powerful tool not just for the military in warzones—but for law enforcement agencies domestically. However, Jay Stanley, senior policy analyst for the ACLU, believes if the camera were to be deployed in the United States, it would raise legal questions. “We hope that the courts will recognize that the Fourth Amendment should provide protection from the kind of suspicionless tracking that this technology makes possible,” he told me. Courts have previously ruled that there is no reasonable expectation of privacy in public places when it comes to surveillance. But location-tracking technologies and license-plate scanners allow for a new kind of ubiquitous retroactive monitoring by law enforcement that privacy advocates believe should require a search warrant authorized by a judge. According to Jennifer Lynch, staff attorney with the Electronic Frontier Foundation, a landmark Supreme Court judgment last year on GPS trackers may have a future bearing on the use of surveillance equipment like the ARGUS in the United States. The judgement in U.S. v. Jones held that law enforcement use of GPS devices to monitor movements constitutes a ‘search,’ making it difficult for police to put a tracker on a car without first obtaining a warrant because it falls under the Fourth Amendment’s protections against unreasonable searches and seizures. Whether the ARGUS will be deployed on American soil in the foreseeable future is anyone’s guess. The technology is highly secretive; in the PBS broadcast, the engineer wouldn’t comment on deployment because he said it was “classified.” Either way, it’s almost certain to ramp up privacy concerns already simmering among lawmakers, who were last week warned about how drones could be used for stalking and voyeurism.